Vicki Carlson likes to plan parties. But the one that was in her honor recently left her bright red with embarrassment, she says. 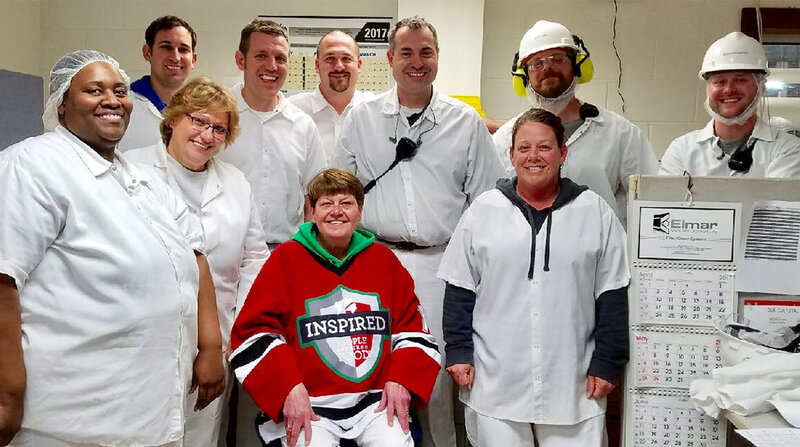 No less than 20 of Vicki’s coworkers gathered to celebrate her Hormel Foods Pride of the Jersey award, the first one to be given out at the company’s Beloit (Wis.) Plant. 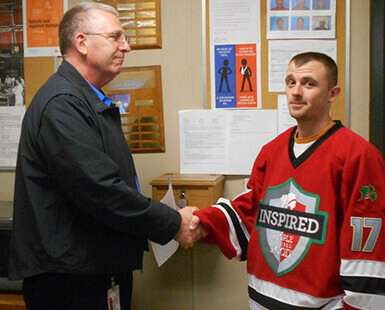 “In the 42 years of the Beloit Plant, there is one person and one person alone whom we can point to as having the largest day-to-day impact on the operation of the plant. 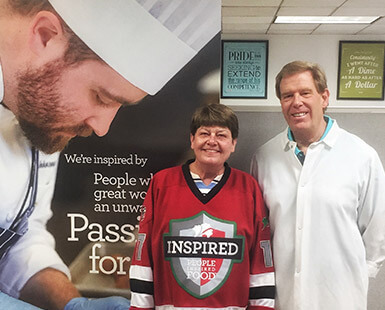 For over 40 years, production scheduler Vicki Carlson has given her heart and soul to the goal of taking care of our customers and scheduling production for over 350 items in a manner that best helps us achieve our key results,” said Plant Manager Scott Ramlo as he presented Vicki with her jersey. Vicki tried her hand at a number of jobs before landing so many years ago on the company that would become the one she couldn’t leave. Her first was detasseling corn for $1.10 an hour. In case that sounds fun, Vicki wants to set the record straight. It’s not. From there, Vicki bussed tables at a supper club, served as a restaurant hostess, worked on an assembly line at a television factory, waitressed, tended bar and held a position in a bank’s bookkeeping department. Then she came face to face with her fate: the Hormel Foods plant in Beloit. “I knew some people who worked there and they really liked it,” she says. Indeed, Vicki is well-known for her dedication to her job and her buoyant personality. 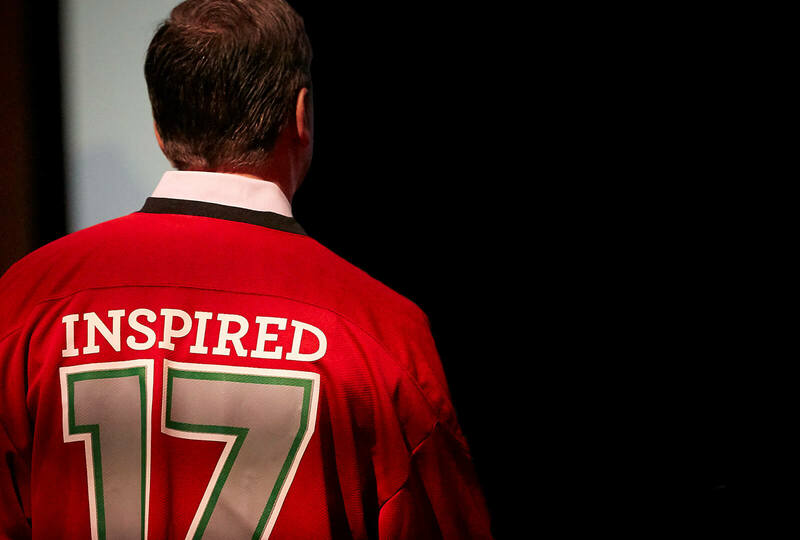 Scott touched upon both during his presentation. “Beloit broke the all-time plant record for finished product tonnage last year under Vicki’s guidance. 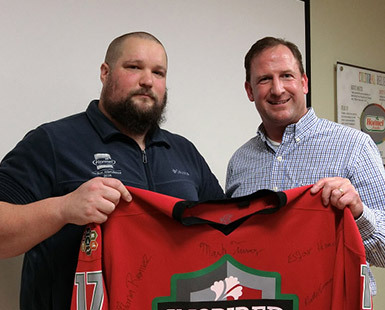 In addition, no one has worked harder than Vicki Carlson on employee events, organizing going-away lunches, retirement parties, collecting for gifts, and remembering lost loved ones and friends,” he said. Plus, her signature laugh can be heard just about daily. This November, Vicki will celebrate her 42nd anniversary with Hormel Foods. She plans on retiring the following month. Taking a trip to California with her husband to visit their daughter is on her to-do list. As is the task of cleaning out a lifetime of memories from her attic. “I still have my maternity clothes up there,” she says, laughing once again and noting that her daughter is now 37 and her son, 32. Leaving the company she loves will no doubt be difficult, but Vicki has no regrets.